The group focuses on physics-based machine learning and signal processing mostly using just weak noise as a source. We have demonstrated this in ocean acoustics, seismology, and radar. For more details see Publications. April 2019: Zhao Chen has graduated. Congratulations Dr Chen! March 2019: Peter Gerstoft will give the Pleneary lecture at the NOISE-CON 2019 Aug 27–29, 2019 on the subject of ‘’Using seismic noise to track cars, trains, airplanes and Greens functions’’. February 2019: Peter Gerstoft will give the Pleneary lecture at the Underwater Acoustics Conference and Excebtion in Heraklion, Crete, June 30th – July 5th, 2019 on the subject of ‘’Machine learning and applications to ocean acoustics’’. Janurary 2019: Emma Ozanich was awarded 2nd prize for best student presentation at the Acoustical Society fall meeting! December 2018: Zhao Chen delivered an excelent thesis defense. Congratulations. October 2018: Stephen Colbert has discovered my research on Antarctica! July 2018: The special issue Compressive Sampling in Acoustics is published in Journal of Acoustical Society of America. June 2018: Welcome to ECE MSC students Ali Dormiani, Hao Zheng, and Ruixian Liu. Feb 2018: Teaching Machine learning for physical applications in the spring quarter. Dec 2017: Peter Gerstoft is giving a month-long class at Zhejian University, China, on Priciples of Underwater Acoustics. Dec 2017: Scientic American highlighted our work on machine leaning for source localization in the ocean The 60-second science can be read here . Dec 2017: Emma Ozanich qualified! Nov 2017: NoiseLab is very interested in data science and its implementation at SIO/USCD. The memorandum can be read here . Nov 2017: Peter gave talks at Seoul National University and ADD in Korea on "Machine learning in ocean acoustics". Aug 2017: Peter gave an invited talk at Eurosip on graph signal processing. June 2017: The group is giving five talks (two invited) (Haiquag Niu, kay Gemba, Mike Bianco, Emma Reves, Peter Gerstoft) at the Acoustical Society of America meeting spring meeting in Boston. May 2017: The group is giving four talks (Haiquag Niu, Santosh Nannuru, Mike Bianco, Peter Gerstoft) at the workshop Big Data and The Earth Sciences: Grand Challenges Workshop . April 2017: Teaching Machine learning for physical applications in the spring quarter. April 2017: Gave an invited talk at Seismological Society of America's meeting on Using Graph Clustering to Locate Sources within a Dense Sensor Array . March 2017: We have 3 presentations at the International Conference on Acoustics, Speach and Signal Processing ICASSP. December 2016: Peter Gerstoft and Jie Li are giving a month-long class at Zhejian University, China, on Priciples of Underwater Acoustics. November 2016: We have 4 invited talks, and 4 regular talks at Acoustical Society of America Fall meeting. September 2016: Mike Bianco qualified. Congratulations! August 2016: Peter Gerstoft and Peter Bromirski published a paper in Science. June 2016: Mark Wagner qualified. Congratulations! March 2016: Zhao Chen qualified. Congratulations! October 2015Post Doc Haquiang Niu and Visiting Student Jie Li joined the group. Welcome! September 2015: Peter visited China in September 2015, mostly staying at University of Science and Technology of China in Hefei working with Professor Huajian Yao . He also gave talks at Institute of Acoustics, State Key Laboratory of Acoustics in Beijing hosted by Professor ZHANG Renhe. and at Institute of Geophysics, Chinese Academy of Sciences,in Wuhan hosted by Professor Sidau Ni. Peter was in Antarctica November 2014, and Zhao and Anja followed in Antarctica November 2015. Scripps news release --- San Diego Union Tribune --- Antarctic Sun. 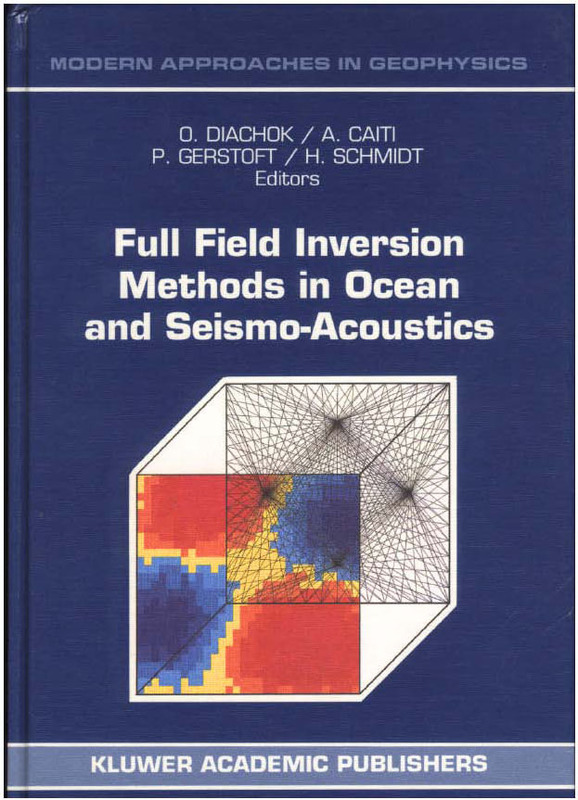 SAGA 5.5: Seismo-acoustic inversion code using genetic algorithms or a Metropolis-Hastings sampling with ocean acoustic and electromagnetic codes. Cabrillo 1.0: Acoustic, elastic and poroelastic wave propagation code using a finite difference Fourier spectral method on a staggered grid. Ocean Acoustics Library/ Other I maintain part of the Ocean Acoustics Library. Remote sensing with noise: Popular presentation of a 2009 paper at the Acoustical Society of America. Comment on Wired to Earth hum tomography on Mars!. From 2009.